Purpose: Use this document as a reference for how to copy and/or add positions in ctcLink. Accept the default of 0000000. Click the Add button. Enter or select the appropriate Position Number. The Current Head Count value will default 0 out of 0. This will automatically change once the position has been assigned to an individual. However, the Max Head Count can be assigned on the next tab. The Status defaults to Active. The Reason defaults to New, change if needed. The Position Status will default to Approved, change if needed. The Status Date coincides with the Position Status and will default to today's date, change if needed. NOTE: Click the Key Position checkbox to indicate whether or not this is a key position. 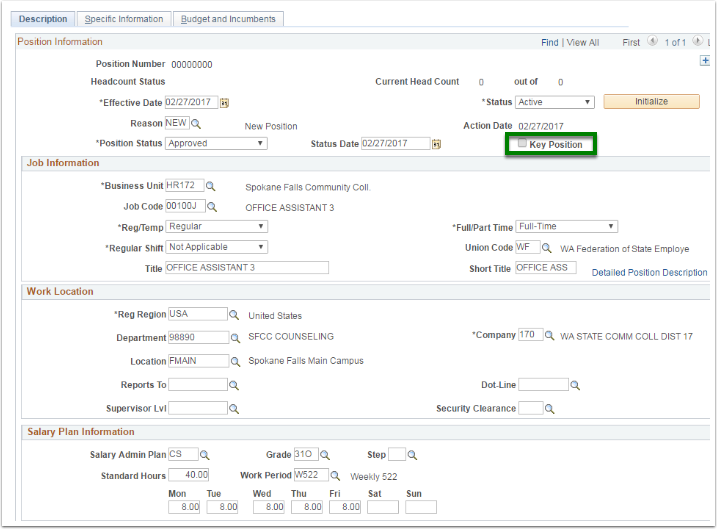 The remaining sections on this tab, Job Information, Work Location, and Salary Plan Information will include default values directly from the position number selected in step 5. NOTE: The Salary Plan Information section will default all salary plan values associated with the Job Code and Salary Admin Plan table. It is important to validate that all values align (i.e. Standard Hours and Work Period). Mis-matches will impact FTE calculation in Job Data when the position is assigned to an employee. The Max Head Count field will default to 1, change if needed. In the Mail Drop ID field, enter the Mailstop number, if applicable. Leave all Incumbents boxes unchecked. These boxes apply to changes being made to a position that is already assigned to an individual. 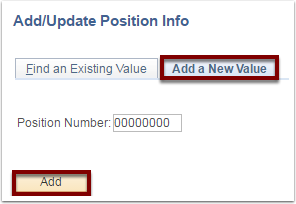 The Budgeted Position box will automatically be checked; uncheck if necessary. Expand the Education and Government header. Note the FTE amount. 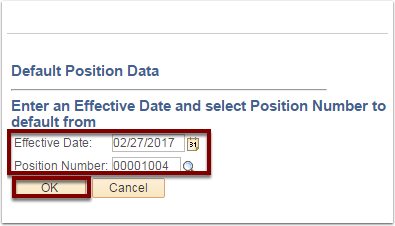 This must be updated such that the FTE amount reflects on the Job Data when a Position Number is selected. NOTE: The Budget and Incumbents tab does not require any entry or editing. The information in this tab will be populated when an individual has been assigned to this position (i.e. Head Count, Empl Record, Name, etc). Congratulations! You have successfully Copied an existing position. Accept the default of 0000000 by clicking the Add button. This allows the system to assign the next available number. The Effective Date will default today's date. Change if needed. The Current Head Count value will default 0 out of 0. This will automatically change once the position has been assigned to an individual. However, the Max Head Count can be adjusted on the next tab. The Business Unit will default. Ensure the information is correct. Click the Job Code lookup icon and select the appropriate job code. (this will auto-fill the remaining fields in this section, as well as, the Salary Plan Information section with the default values from the selected job code). Click the drop down menu in the Reg/Temp field and select the appropriate work status. The Regular Shift field will default to Not Applicable, change if needed (i.e. Evening). The Title will default the title description directly from the Job Code selected, change if needed. The Full/Part Time field will default to Full-Time, change if needed. The Union Code will default to the value associated with the selected Job Code, change if needed. The Short Title will default the description associated with the Job Code, change if needed. NOTE: Job Description information can also be stored on this page. Click on the Detailed Position Description hyperlink. This information will be entered manually as free text, but can be copy and pasted from an existing document if applicable. The Reg Region will default to USA. Click the Department lookup icon and select the appropriate department (Required). Select the appropriate Location from the lookup menu (Required). In the Company field select the appropriate Company Description. NOTE: The Salary Plan Information section will default all salary plan values associated with the Job Code and Salary Admin Plan table. It is important to validate that all values align (i.e. Standard Hours and Work Period). 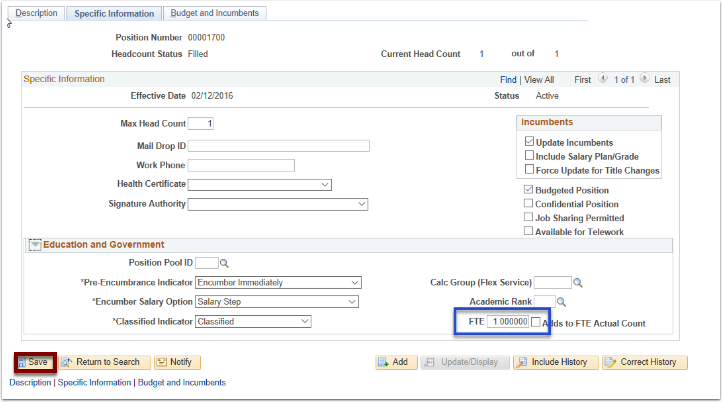 Mis-matches will impact the FTE calculation in Job Data when the position is assigned to an employee. The FLSA Status will default the value from the Job Code, validate the coding is correct. The Bargaining Unit will defaults to 8888 which is an unassigned value; change if needed. Note the FTE amount. 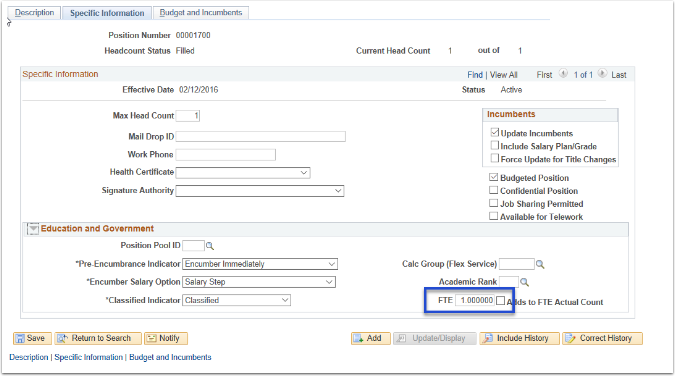 This must be updated such that the FTE amounts reflects on the Job Data when a Position Number is selected. Congratulations! You have successfully created a new position.